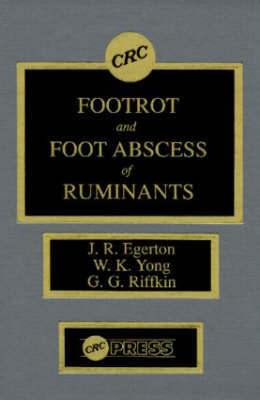 During the last two decades substantial advances have been made in research on footrot and foot abscess. The results of this research are presented in this volume. Footrot and foot abscess differ from most other communicable diseases in that they are mixed bacterial infections, which are regarded as the most economically important contagious disease of sheep in Australia today. This book is aimed at practicing veterinarians, government animal health officers and research scientists who are interested in diagnosis, treatment and prevention of economically important bacterial diseases of the ruminant hoof. It covers the microbiology of two major pathogens, Bacteroides nodosus and Fusobacterium necrophorum, and the pathology, immunology and epidemiology of footrot and foot abscess. It contains up-to-date information on various strategies currently used to control these diseases in sheep in Australia and New Zealand. Of special interest to clinicians will be sections on diagnosis which are comprehensively illustrated with pictures of various clinical entities together with differential diagnosis of other infections that localize in the digits. Developments in immunological control recently advanced by exciting opportunities to produce defined vaccines by recombinant DNA technology are also reviewed. Consideration is given to the application of biotechnology to rapid and accurate diagnosis. Sections on diagnosis are illustrated with pictures of various clinical entities together with differential diagnosis of other infections that localize in the digits.